This newly opened mountain retreat offers exquisite contemporary mountain decor, fine Colorado woodwork, and beautiful hardwood floors. The Pines Lodge is decorated with an elegant touch and top of the line furnishings throughout, including gas fireplace, granite counter tops, steam shower and wine cooler and personal Jacuzzi. 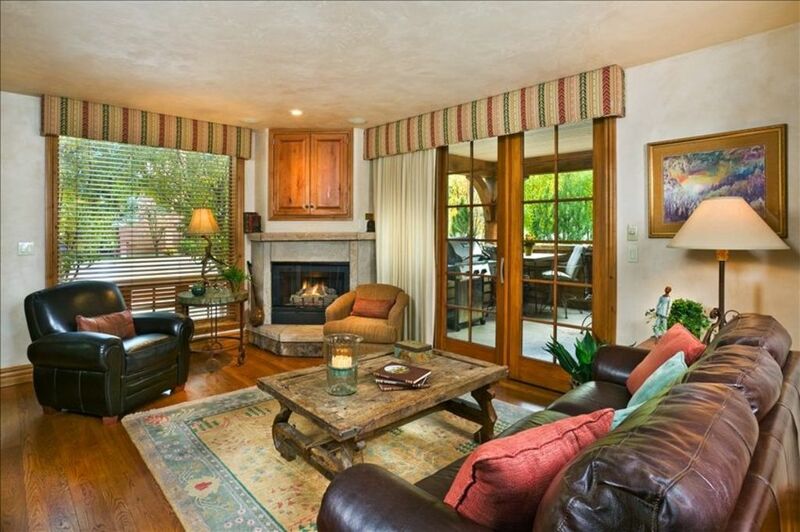 Enjoy the easy access to town and glorious views of Aspen Mountain or an easy walk to chair 1A. The Master Bedroom has a King Bed, LCD TV and private bath including a steam shower with beautifully natural stone tile. The Second Bedroom has another King Bed, TV and private full bath. The Third Bedroom has two twin beds and TV. This comfortable unit has a great galley styled kitchen with a long bar just off the generous living room and lastly a full dining table with seating for 8. Outside is a wonderful deck facing Ajax Mountain with its own BBQ and Jacuzzi to soak in after a long day of hiking or skiing. For the ski enthusiasts, we offer a ski storage room complete with hand and boot warmers which becomes a bicycle storage room in the summer. This was our second time to stay in this condo. The location is perfect for anything you’d want to do. No car needed. We walked to shops, restaurants, bars, base of Aspen Mt. and the bus station, which takes you to Snowmass and other nearby mountains. The condo itself is very homey and comfortable. Great location. Housekeeping came about every other day, maintence came in to check the pool. You could hear the neighbors pretty loudly. Pines Lodge #415 could not have been more perfect for our family of 6. Modern and updated in every room, and large enough for 6 adults to comfortably stay. Location is perfect for walking back and forth to everything in town. Would definitely stay here again before checking out any other accommodations. Thanks! Even better than photos and with fine access to all of Aspen! This unit was perfect for the six of us! property and location were great. There were two concerning issues about the initial rental. First, owner decided right before final deposit was due that they wanted to come early so could have left us high and dry without a place to stay in Aspen. We worked thru that but on our last day despite check out being at 11 AM, cleaners turned up around 9AM wanting to know when we would be out. We told them within an hour but they came back at least once to be sure we were on tract to leave, before the 11 AM checkout, and they put in a load of wash."Don't let the screen door hit you in the rear on your way out!!!!" Not sure how serious the owner is about renting this unit. We were so sorry about having to cancel the booking over 2 months prior to the arrival but as an owner or a guest, we both have the ability to change or cancel the booking up to 30 days prior to coming in. This is detailed in the VRBO property profile. My husband and I stayed at this location over my birthday weekend and we both were impressed. The condo was very clean, comfortable and had everything we needed for our 5 night stay. The 3 bed/3 bath layout was more than we needed, but we were sold due to the location. The furnishings are beautiful and the kitchen and bathrooms are all updated. The bedrooms are a little snug, but you only need them for sleeping, right? The master bathroom is nice, but the bedroom seems smaller than the second bedroom. Because of that, we chose to sleep in the second bedroom and I took over the master bath. You are only 2 blocks from the prestigious St. Regis Hotel where we got massages (don't waste your money~one of the worst massages I've ever had). We were within walking distance to everything we wanted to do; restaurants, shops, bars, etc.... We rented skis from Aspen Sports (recommended by Larry) and they were great. Spencer delivered and picked up our equipment at the condo at no extra charge (we tipped him, of course). We chose to ski at Snowmass rather than Ajax because of the lack of snow (Ajax can be a bit more challenging and we wanted wide runs). Larry was great to work with and he responded quickly to any questions we had. The hot tub was used daily and a nice way to end a day after being on the slopes. However, whoever rented before us had the temp too hot and we couldn't get in until we turned it down and allowed it to cool. Also, we could only open the lid half way because there wasn't enough room between the tub and the wall to fully open it. My husband thought he had it secured after fiddling with it for some time. However, once he sat down to relax in the tub, the lid came crashing down on the side of his head and shoulder. YIKES! After that, we just left it half closed each time. There is no need to have a car if you stay here. We took Uber from the airport, walked the 3-4 blocks to the bus station for Snowmass and walked every else we wanted to go. We will stay here again without a doubt.